The teachers’ strike in Chicago requires immediate action. Regrettably, there are no simple answers. Mayor Rahm Emanuel wants to reduce the agreed-upon pay increase and extend the school day. Besides this abrogation of the terms of a previously negotiated contract, he insists on evaluating teachers based on their students’ test scores. Over the past generation or so, teaching has moved from primarily an art form to a science. It started as there was a demand for so-called teacher accountability. The process was formalized during the presidency of George W. Bush and his “No Child [or was it ‘No Test’] Left Behind” program. It has been modified, but primarily in cosmetic ways, by President Barack Obama’s “Race to the Top” program. With the changes, a fundamental question needs to be asked. What is the difference between art and science? The answer, may be beyond anyone’s pay grade. But it seems likely that a key difference is that real science involves measurement. If the measurement is to be meaningful, then it must focus on data that is real and empirical. It must be able to be analyzed via a controlled experiment. The problem in measuring teacher performance is that no two teachers are dealing with the same set of variables. Every child is different; the aggregate of all the children in a classroom is different. Some come from well-educated homes; some come from dysfunctional ones. Some come from homes with nutritious food and a library of books; others come from homes with little food, often of the “junk” variety, and nothing to read while the television blaries with violent and pornographic programming. Urban education has been in deep trouble since our large center cities began to decline following World War II. When I started teaching in the city of St. Louis in 1969, I had a classroom of 40 fifth graders. Needless to say, I did not provide them with the type of education that they needed and deserved. The problems were straight-forward: there were too many students in the class, and I was inexperienced. As I gained more experience and moved to schools where there were 18-20 students in a class, the quality of my performance improved considerably. Fortunately, I did not have to worry about standardized tests and competition with other teachers. We all did the best we could. Sometimes what we did worked; sometimes it didn’t, but that’s the nature of an art form. Fortunatel,y I’ve gotten generally good feedback from former students, so presumably I did a fair number of things well without an inappropriate intrusion by government and profit-driven actions by the corporate-education complex. I say this as someone who generally feels that the government should be more involved in our lives, particularly in providing a sound safety net. 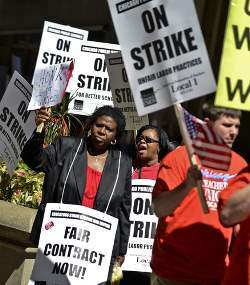 Teachers also clearly saw the strike as a protest not just of the union negotiations in Chicago but on data-driven education reform nationwide, which many perceived as being pushed by corporate interests and relying too heavily on standardized tests to measure student progress. The primary disagreement appears to be teacher job security in the wake of a new program that evaluates teachers based on students’ standardized test scores. Chicago Teachers Union board member Jay Rehak called the idea “data-driven madness. As many as 6,000 teachers could lose their jobs under the evaluation system, according to Lewis, who called the system “unacceptable. d to grade papers. To add the burden of measuring students’ performance on the immeasurable, it becomes too much for the teachers. It tells administrators absolutely nothing, and it actually causes students and teachers to cheat. It’s certainly true that there are many teachers in the classrooms who are doing a disservice to students and would best find another profession. But test scores are not the way to make these decisions. We’ve always had to ask teachers to leave the profession. For years, department heads and principals made these decisions, based in part on empirical evidence, intuition, and quite frankly gossip. It wasn’t a perfect system, but it was better than what we have now. A teacher could be asked to explain material more clearly, or give less homework, and his or her fate would be determined by how well he or she did so. It wasn’t perfect, but there was far less pressure than there is now. Like many, I look forward to the Chicago teachers’ strike ending. But I want fairness and dignity for the teachers, values not necessarily associated with Mayor Emanuel. Education has become a sick culture, and the mayor is just reflecting the current norms. For this to change, it will not happen through one labor settlement. It will probably take a generation or two to (a) bring fresh blood into the teaching profession, teachers who are child-centered and see their profession as an art form, and (b) to dismantle the educrat bureaucracy that has created and perpetrated so many of our current problems. It won’t be easy, but with sensitive and logical actions by teachers, students, and parents, it is within the realm of possibility. Let’s take the short victories where we can, but keep our eye on the long-term solutions. Note: Arthur Lieber is the author of Standardized Education: Moving America to the Right. Next Post:Could details of DNC convention logo influence voters’ perceptions?